Welcome To The Travelin' Rat! Our mission is to help animal rescues, especially those that take in rats, wherever we can, in whatever way we can. We generally do this through our fundraising efforts, but we also help rescues by sitting with them at events, helping with transports, and spreading the word when rescues need help. HELP FEED THE ANIMALS - VISIT THESE SITES DAILY! SIGN UP FOR DAILY REMINDERS! A donation program dedicated to helping rescues and small animal adopters provide the very best care! Nominate your favorite rescue and a feature rescue will be chosen from nominations every two months. The chosen rescue will receive FREE carefresh bedding and coupons to give out with adoptions. *501(c)(3) rescues are preferred BUT if a non-501(c)(3) rescue is nominated they will look into it! 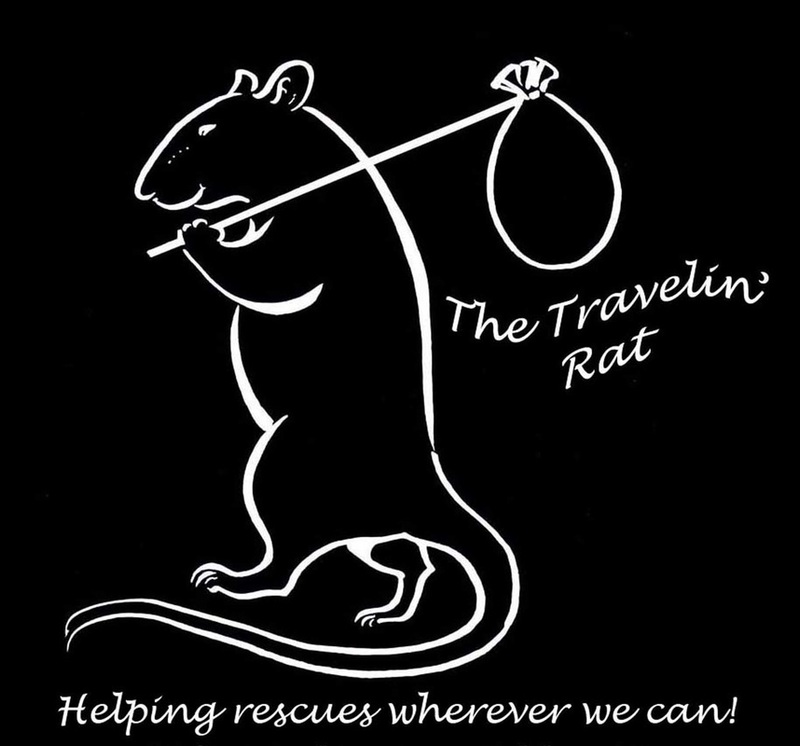 The following rescues have submitted registration forms with The Travelin' Rat in 2019. They are eligible for help from TTR throughout the year. If you are a part of a rescue or a rescue supporter and don't see your rescue that takes in rats listed here, feel free to pass on our registration form. *At this time, these rescues do not have US 501(c)(3) status. Therefore, donations to them are not tax-deductible. Sign up to receive newsletters from your favorite rescues! ​Register with The Travelin' Rat! In order to receive help from us, download our Registration Form and submit! Registration is good for a calendar year. We ask for updates every January. and they are then able to apply to be a Rescue of the Month. Scroll to the bottom of our How To Apply page to download the form. As of June 1, 2017, The Travelin' Rat is no longer a non-profit, 501(c)(3) organization! We are maintaining our website and social media so that we can continue to help rescues. However, we have removed ourselves from any fundraisers that we were involved in and can no longer take in donations. You can find out how to help our current Rescue of the Month on our Rescue of the Month page. We try to keep up with events, like fundraisers for rescues and sweepstakes for you to enter, on our Current Promotions page. Please also keep an eye out on our website and social media for information about any multi-rescue events that are happening. For ways to help rescues directly and rescues that are involved in each fundraiser, please check out our Ways to Help Us Help Rescues page. Thank you for all of your support of us throughout the years. We're thrilled to have helped the rescues as much as we have in the past, and look forward to continuing to do so! If you would like to know what goes on with us and the rescues we help, please sign up for our newsletter. We want everyone to know who we're helping and how we're helping them, and signing up for our monthly newsletter will keep you informed!